Anyone who knows me will tell you that, more often than not, I've always got a camera about my person. But it's inconspicuous1 and can sit quite snugly in my inside pocket. Be it a 35mm SLR or a simple point and shooter, it's always on hand. I always say that were it not for me the Medd family photograph album would be nothing more than a couple of faded snaps sitting in the bottom of a kitchen drawer full of rubbish. In my head I'm always framing a potential photo opportunity. People. Places. Things. Anything really. Even sheep. However, when I saw this flock the other day I'd only got my phone with me; so that had to do. 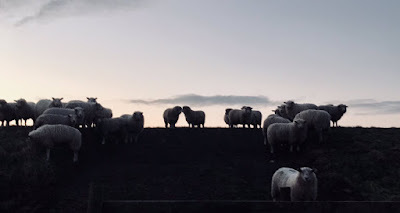 It was late afternoon as I approached my woolly friends, and the light was fading. As soon as they spotted me they all stood stock still and wouldn't take their eyes off me; quite unnerving. It's at this point I feel I should give you my Top 10 Sheep Songs. But I leave that sort of thing to the mighty Rol. What he hasn't turned into a Top 10 you could fit on the back of a postage stamp2. That said I will leave you with two sheeps, not least because they make me laugh; for different reasons. Robert Wyatt always makes me laugh. His music is invariably uplifting and joyous. And mischievous. Everything he does will put a smile on my face. Somebody once said about him: "It can be a bit like finding Tommy Trinder popping up in the middle of Yessongs or Del Boy guesting with the Mahavishnu Orchestra." Yeah, I'll go with that. Second sheep - Sheep May Safely Graze (surely in J S Bach's Top 10?). Whilst, obviously, not a laugh out loud piece of music by any means, please take a few minutes to watch this most pretentious and preposterous bit of footage of Khatia Buniatshvili playing a Steinway grand piano in the middle of a forest(!). And all the while tossing her Harmony hair-sprayed mane and giving it serious 'bedroom eyes'. A fine tune indeed. But hysterical nonetheless3. That is a bit hilarious isn't it - I thought we were going to lose her inside the piano at one point, and why was she wearing her swimming costume? Like your pictures - Means you are really "seeing" life, as opposed to letting it pass you by. There are far better versions and interpretations of this piece on Youtube; but I couldn't pass up on sharing this one! Ha, great video. All it needed was Paul Whitehouse in the audience to stand up and say, "Anyone fancy a beer?" Sheep are fascinating creatures I think. Curious but sheepish (sorry). It's as if somewhere deep inside they want to connect with us more than they do, and then get the heebie jeebies. I love the photo. Sheepish indeed. I'm looking forward to adding to my sheep 'portfolio'.